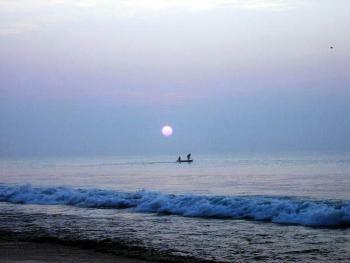 The Long stretch of Beach at Puri, known as Mohodadhi is one of the largest ( 7 Km ) and loveliest in india. Most of the foreigners like this Beach and Indian corporate people, recommended this beach as one of the best resorts in India.Sea beach at Puri has it's own golden sandy look and beauties of nature. Like other Sea Beach of the world Puri Sea beach attracts lot of foreign visitors to spend some hours. Waves of Puri Beach, is not high like Indian Ocean, so people are enjoying long time for bathing. Now a days people are busy with their current schedule of work, they get very little time to enjoy the actual beauty of the nature. Perhaps they don't know, Life is very short span of time, they should visit the place which gives them peace and reduce mental tension.